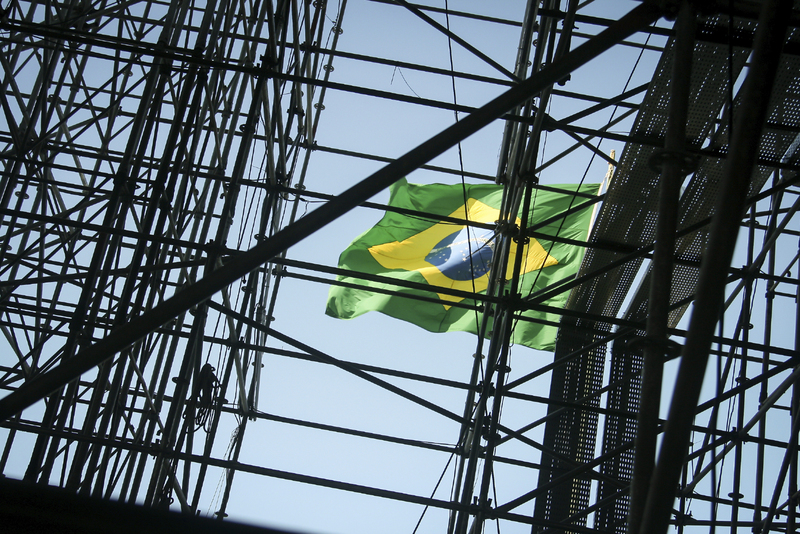 I’ve written before about how developments in Brazil are bad for working people, but the situation is getting worse, and with the Rio Olympics less than 10 weeks away, the world’s gaze may eventually turn to what is going on in one of the world’s leading emerging economies. 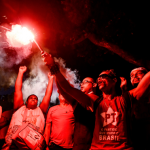 The TUC has joined with trade unionists and civil society in Brazil, trade unionists around the world and Latin American governments in branding the new Brazilian regime illegitimate. That message is beginning to get out, and Frances O’Grady’s recent Huffington Post blog on the subject has been echoed by Labour’s Shadow International Development Secretary, Diane Abbott MP. Newspapers like the Guardian – which initially reported the parliamentary coup as just a squabble between competing politicians over corruption – have woken up to the malign political intent of the coup plotters. MPs from three Westminster parties signed a letter in the Guardian on Friday to deplore the coup as an insult to Brazilian democracy. But there is still a lack of awareness of what is going on in Brazil, and it’s up to people like us to make the position clear. 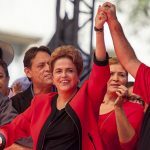 There is, indeed, an element of corruption in the story – but the coup leaders were more mired in that corruption than the Workers Party supporters of President Rousseff (the Economist has gone on record that Dilma is not corrupt.) One of the new all-white, all-male Ministers in the new government has already had to resign after a tape was released in which he was heard explaining to a colleague that the coup was necessary to stop investigations of corruption in the giant Petrobras oil company. But what is more sinister is that the new Government has wasted no time in implementing a reactionary set of policies designed to unpick the steps towards social justice that the Workers Party under Presidents Lula and Rousseff had implemented. And supporters of the Workers Party fear repression and reprisals if they continue to speak out for the democratically-elected President. Demonstrating how nervous the new regime is, the new international relations minister has instructed all Brazilian diplomats around the world to combat any public statement, from Brazilians and non-Brazilians (we’re waiting! ), that says the impeachment is a coup. 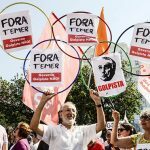 We will not be silent, we will continue to work with CUT and Workers Party supporters here in Britain, and we will not stop supporting our fellow trade unionists in Brazil in their protests against the illegitimate regime of Vice President Temer. Next week, I’ll be part of a protest at the conference of the International Labour Organisation in Geneva, and, as the Rio Olympics draws closer, you can expect more protests and more solidarity. 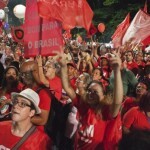 Brazilian unions protest for Lula and for justice Brazil’s unions rally against illegitimate Government’s privatisation & cuts agenda Brazil teeters on the brink of counter-revolution TUC backs Brazilian unions: no to the coup!